When asparagus season arrives, I turn into an asparagus hoarder. It seems just as it arrives in stores, it’s gone almost as quick as pomegranate, fava beans or cherries. I feel a sense of urgency to make the most of this seasonal super star. I used to not know what to do with fresh asparagus. But after shifting to a vegetarian lifestyle over 15 years ago, I’ve learned so many ways this lanky vegetable can be enjoyed: roasted, shaved, blanched, grilled, puréed or stir fried! What’s your favorite way? 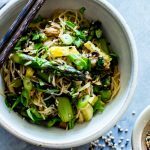 Since asparagus pairs deliciously with Asian flavors, I thought it was time to share a spring vermicelli bowl. Rice vermicelli are a thin form of rice noodles used in Asian cooking. They are sometimes referred to as rice noodles, or rice sticks. But they’re different from cellophane noodles or bean thread noodles in that these are made from mung bean or rice starch rather than rice itself (wikipedia). Bean thread noodles are a bit chewier than rice noodles, but seem to pick up the flavors of the sauce more readily than the rice noodles. Rice noodles have a nice, tender texture, but don’t pick up as much flavor. Both varieties can be prepared using a cold water soak method (see recipe). You’ll use your largest sauté pan. I use a 10″ pan, and while it works, it’s crowded. First, soak the rice noodles in cold water while you pull the rest of the ingredients together. I’ve not bothered following rice noodle package directions after doing so landed me in the mushy noodle department. That’s no fun. Remember… soak in cold water. Next, chop the veggies and cook up the eggs into a flat pancake. 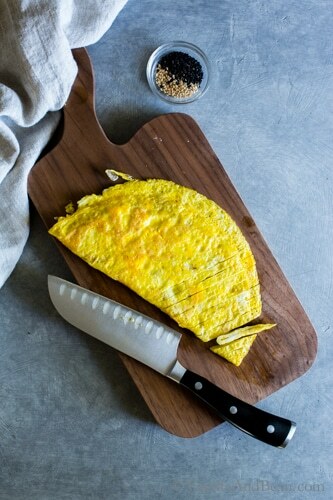 Slice the egg pancake into bite size pieces. Now you’re ready to start cooking the veggies. Sear the mushrooms, then add all the other veggies to the pan a little at a time so each addition has time to cook. Add the garlic next. Enjoy its intoxicating aroma, then pour in the sauce. Bring to a simmer, then add the rice noodles. Last, gently toss the noodles with the sauce and veggies while cooking another few minutes, adding the thin egg slices to rewarm. The noodles soak up the sauce and infuse them with flavor. 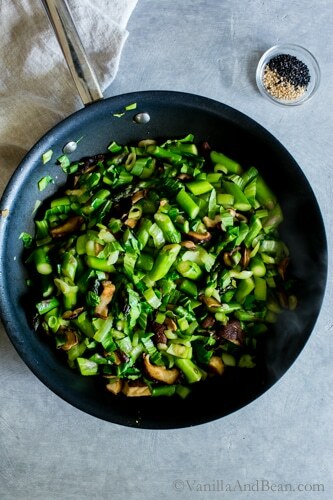 Garlicky Asparagus, Mushroom and Bok Choy Noodle Bowls come together in under 30 minutes and in one pan! Hooray! Before turning on the stove, be sure to have all your veggies and sauce prepped and ready to go as this vermicelli bowl recipe comes together fast! 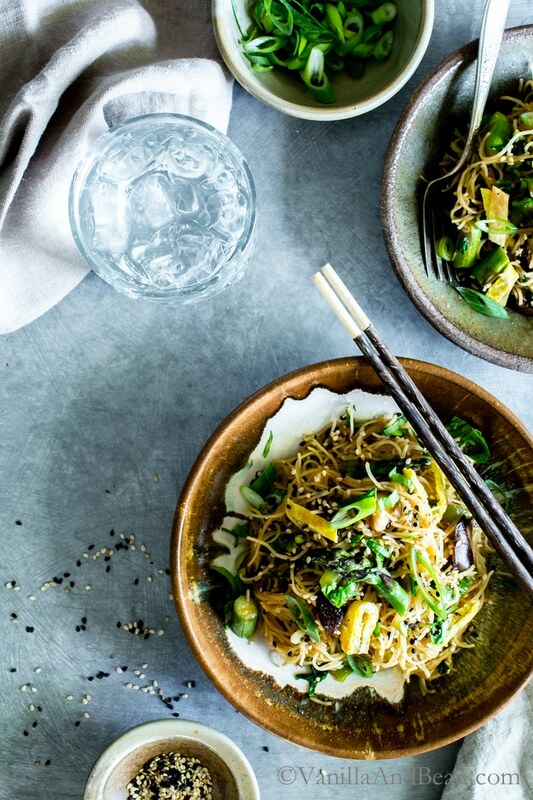 Share garlicky asparagus, mushroom and bok choy noodle bowls with plenty of sesame seeds, scallions, Siriacha, more Tamari and Thai basil (if available). Some vermicelli rice noodle package directions indicate soaking the noodles in hot water. This has failed for me every time. I always soak in cool tap water, otherwise the noodles don’t stand up to cooking and turn to mush. Remember to cold soak. 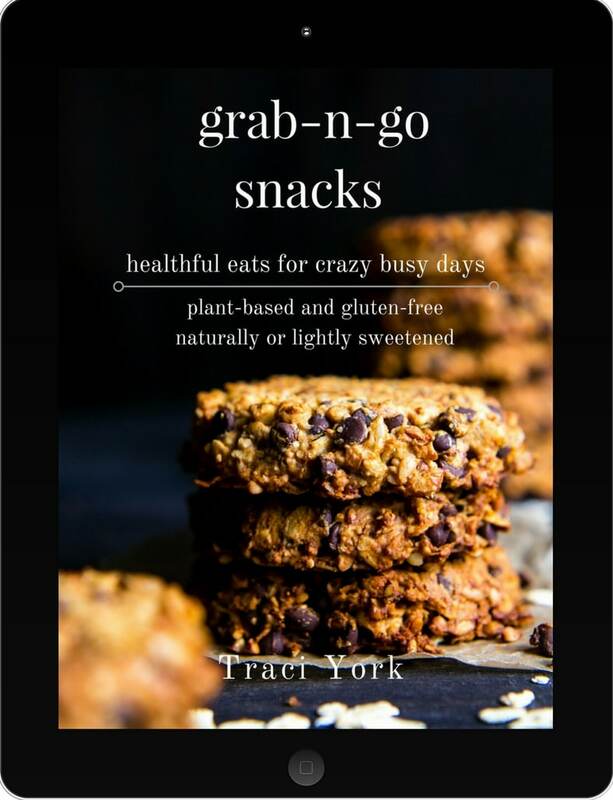 Easily vegan? Yes please! omit the eggs and add toasted cashews or baked tofu (just baked and sliced – no marinade). Freezer friendly? This vermicelli bowl recipe is better fresh off the stove or refrigerated up to three days. I do not recommend freezing. In a large bowl, add the rice noodles and cover with cool tap water. These can soak while the remaining ingredients are prepared. Meanwhile in a large saute pan (I use a 10" and it gets very crowded! ), add 1 tsp of oil and bring to a shimmer. Pour in the whisked eggs, a pinch of sea salt and a few grinds of pepper. Cook on low without stirring, flipping the 'egg pancake' in half to finish cooking for a total of about 3-4 minutes. Remove from pan and slice into thin bite size pieces. Set aside. 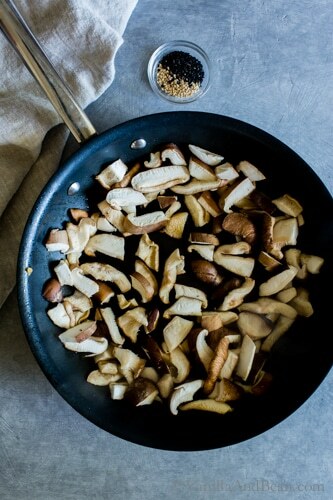 To the same pan, heat 3 tsp of oil and add the sliced mushrooms. 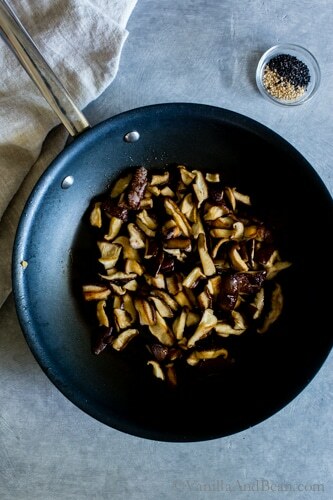 Cook in an even layer on medium-low to sear, tossing and flipping the mushrooms a few times for 6-7 minutes. 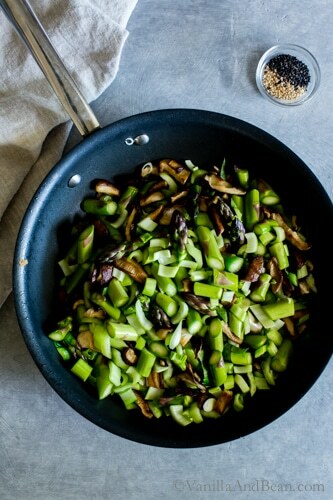 To the pan with the mushrooms add one more tsp of oil and add the asparagus, white parts of the scallions and white stems of the bok choy. Cook on medium low for about 6 minutes, tossing and flipping the ingredients at least twice while cooking. 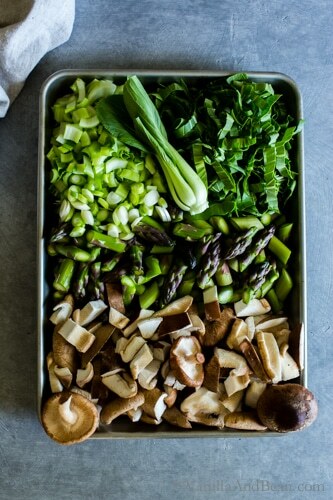 The vegetables should be tender-crisp at the end of this stage of cooking. Add the garlic and stir, cooking for about 1 minute. 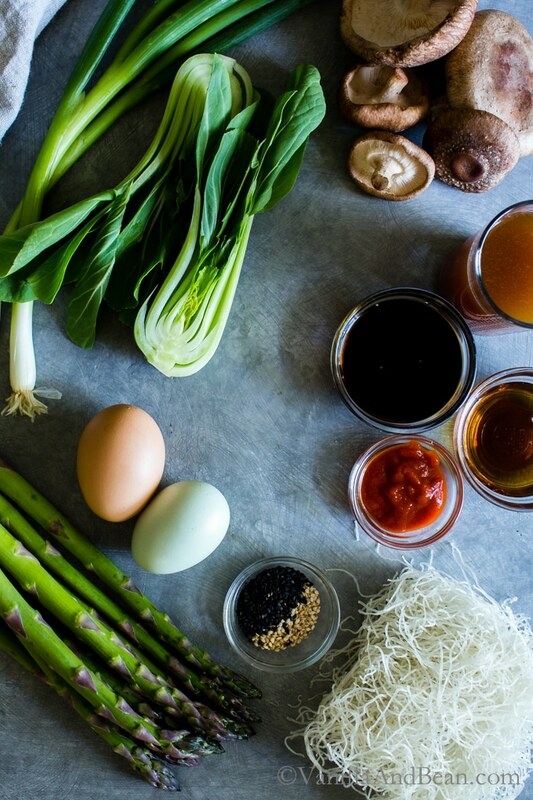 Whisk the vegetable broth, Tamari and Sriracha together and add it to the vegetable mixture. Bring up to temperature just until the edges of the broth begin to simmer. Stir in the green leafy parts of the bok choy. Drain the noodles and place in the saute pan with all the veggies. Carefully toss and turn the noodles with the veggies until everything is mixed well making sure the noodles have plenty of contact with the sauce. Cook for about 1-2 minutes on medium low. The noodles will soak up the sauce and be tender, but not mushy when ready. Toss in the egg slices (or cashews*) and give the mixture another toss before serving. Serve with Tamari, Sriracha, sesame seeds, tops of scallions and Thai basil. Store leftovers in a lidded container in the refrigerator for up to three days. *For a vegan option, omit the eggs and add toasted cashews or baked tofu (just baked and sliced - no marinade). Is there a place to find nutritional content of your dishes? Hello Charletta! Thank you for your note! 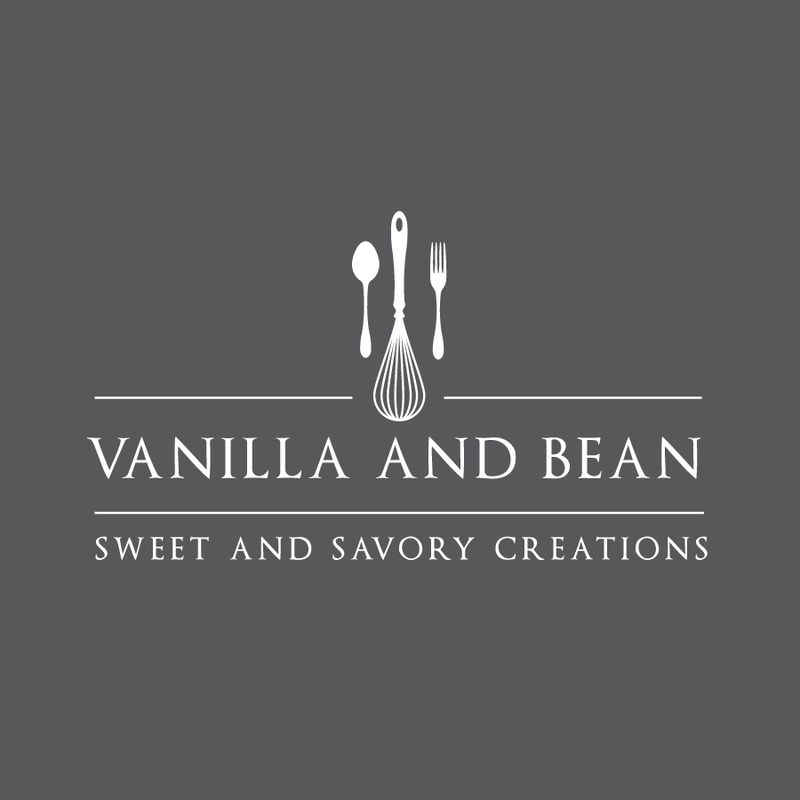 Nutritional content of my recipes is not a service I provide. There are a number of online calculators to choose from through Google. Please feel free to plug in the ingredient list at any one you choose. I hope this helps. Delicious, thank you for creating this and letting me copy you. So good! So happy you enjoyed it, Marie! Thank you for your note! This is a perfect example of the perfect meal in my eyes. I love all of those simple flavors together and could seriously eat them every single day! Thank you Lindsay! I’m in love with Thai flavors too. They just pair so well with fresh veggies! When I saw this recipe I knew I had to try it. Just finished. Your instructions were perfect and the pictures really helped. It tasted great! Thank you once again for a wonderful recipe and dinner. This sounds fantastic! And I adore the photos! 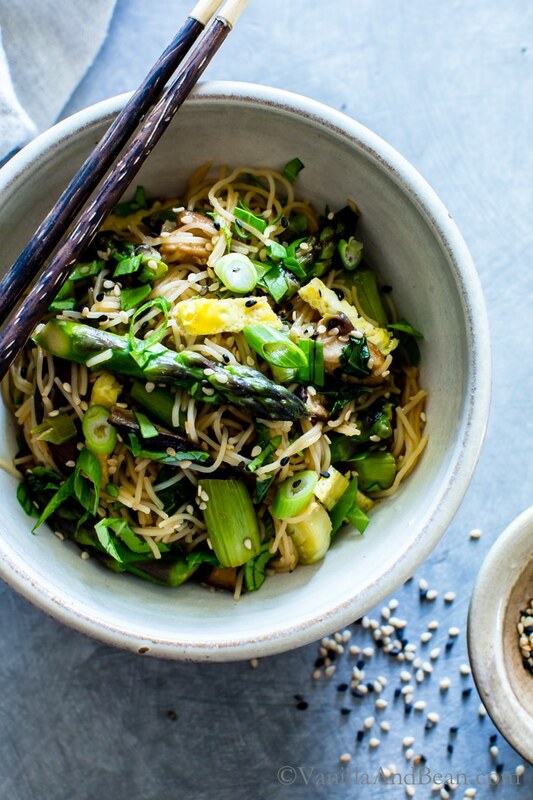 Hurrah for asparagus and noodle bowls! Love asparagus any way I can fix them. Experimenting with noodle bowls this year and loving the ease and quickness of them. My husband has been loving them, too. Thank goodness he is not a picky eater. Thanks for sharing this recipe. Can’t wait to make it. You had me at garlicky asparagus!! Holy deliciousness. It’s even more sparse in these parts so I totally understand the need to make the most of it while you can. I’m obsessed with all of the flavors in these bowls. So healthy and vibrant! Nice work, Traci!! It’s the garlic, right? I’m with ya! Augh…. when I lived in South Texas, when I saw fresh asparagus I thought I was in a dream!! It was so rarely there. Most of the time all I could get my hands on was canned :/ Then, I just skipped it. I hope you get your hands on some fresh Asparagus Sarah! Quick and easy dinners are just what I need this time of year – love these pretty bowls! I can’t wait to try this, it’s unlike any noodle bowl I’ve had, but it looks totally do-able, and I have all the ingredients on hand! Can you omit the mushrooms? i love the flavor of mushrooms just not the texture ; ) Otherwise sounds so delicious! I’m an asparagus hoarder too, Traci. This year asparagus was very hard to find – I didn’t see any big displays of asparagus in the markets that I usually see in the late spring. As for this recipe – I love all the flavor and texture you’ve got going on in this dish. Savory dishes are my thing. I want to eat a huge bowl of this! Have a great weekend! LOL – we need an asparagus anonymous group! hehe…. I hope you can find some asparagus G! My favorite is roasted asparagus Traci, but I honestly enjoy it all different ways. I add it to omelettes, pasta, sandwiches, wraps…however I can. Of course, you know who is not a fan. Likely story. But sometimes I purposely cook it as a side for dinner and don’t make anything else so he’ll have to try it. Wicked, aren’t I?! Some nights it works, some nights not. I love the combo of veggies you’ve used in these bowls and love that the sauce is light and a bit spicy. I’ll need to give these a try and perhaps sub in broccoli for the asparagus for Tom. Thanks for sharing and have a great weekend! Mmmm, I love roasted too Mary Ann! Have you tried it with avocado and toast? LOL – likely story…But I love your wicked approach – haha! I feel your pain!! Luckily Rob loves asparagus. The broccoli sub sounds fabulous!